27 March 2014, 11:11 a.m.
As an informed senior executive, you already know that it's no longer a question of whether cloud service adoption is the right forward-thinking business technology strategy, but rather how you will leverage the abundance of new resources to outpace your competition. More companies will be working within very heterogeneous cloud service environments, thereby putting more pressure on IT organizations that must deal with these additional complexities, according to a recent market study by Cloud Connect and the Everest Group. Their latest market study reveals the increasing influence of cloud services on IT budgets, staff skills and business strategy. Moreover, the findings within the "2014 Enterprise Cloud Adoption Survey" report debunks hyped-up perceptions with key facts. "The new reality our research points to is that the modern enterprise will not be defined by public, private or hybrid but rather all of the above," said Steve Wylie, cloud connect general manager. Hype: The CIO role is dead. Fact: While the CIO role and the overall IT organization have been under fire over the last couple of years -- as cloud has enabled people outside of the CIO/IT organization to source their own technology -- more than 75 percent of the enterprises surveyed believe its critical for the cloud services ecosystem. Hype: Cloud is relevant only for technology needs. Fact: Historically, moving to the cloud has been viewed primarily as a technology cost savings – providing cheaper computing and storage. Today 56 percent of enterprises consider cloud service adoption to be a strategic business differentiator that enables operational excellence and accelerated commercial innovation. 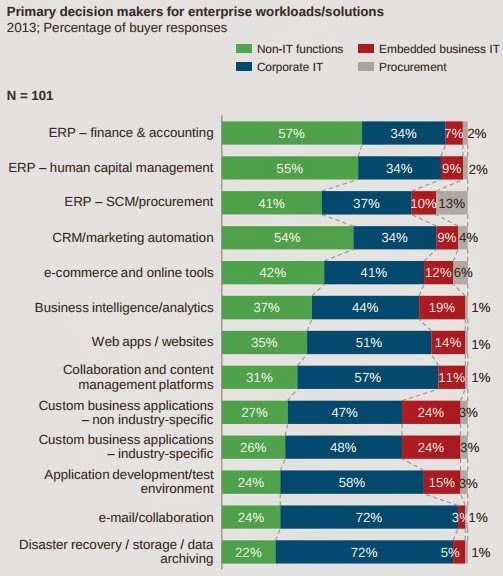 Hype: Enterprises are hardly spending on cloud services. Fact: As the value proposition of cloud is increasingly being realized, the study found that 58 percent of the enterprises spend more than 10 percent of their annual IT budgets on cloud services. Hype: Security concerns are a thing of the past. Fact: Enterprises still consider better security and greater control over assets and data to be some of the most important factors in choosing a cloud service solution. While this used to mean that they would automatically choose private cloud for security, this scenario is expected to change as public cloud providers are making considerable investments to strengthen their security architecture. That being said, Open Hybrid Cloud is expected to be the way forward. Hype: Cloud consumption is simple. External help is not needed. Fact: In actuality, more than 65 percent of enterprises believe they need help to deploy cloud solutions as most lack the internal IT skills and expertise needed for effective deployments. Most companies are likely to engage third-party service providers and so it will be important for these providers to adopt a business process-oriented approach, while assisting in the cloud adoption journey.